And now I'll have that song in my head for the rest of the day, complete with the ahhhhh, chorus in the background. One of the best things about my job, and working in client service, is that it allows me to visit some of the best restaurants in town. Love that. Ok, really, I just love trying the desserts at them. One of my habits is making sure to request the dessert menu along with the regular menu, so that I can figure out what meal I should get in prep for dessert. That's vital info, or else how can you know what to order for the meal? Obvi, if you're in a restaurant where there's a dedicated pastry chef listed on the menu, you can't go wrong. Unless you don't see anything chocolate on that dessert menu. And that's a sad little restaurant, indeed. Anyway, ya'll, I haven't a clue where this magnet came from. 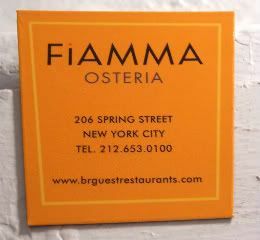 I've never been to Fiamma Osteria, and it's not even open anymore down on Spring Street, though they still have a location at the MGM in Vegas. It's a BR Guest Restaurant though, which means that it was pretty nice, with great food, I'm sure. But, that's kind of the guarantee you get with BR Guest places, methinks. If you haven't visited any of their restaurants, get thee there soon.